← What’s the Easiest Shape to Build? Gringo blocks (wood blocking) are used to attach things to earthbag walls. It’s easy to hang or attach things on earthbag walls. Simply embed wood poles or blocks between courses of earthbags as you’re building. Some call these nailers, some call them gringo blocks. I also use rebar a lot to attach things to walls as I’ve explained previously. Yayyy a week! Scott Howard had it with him while I took a class, and I made it a point to take a look at it, but somehow amidst the madness I forgot to take a peek. I am looking forward to the new book in whatever form. I just bought new toner and ready to print it here if needed. :) I am still working on the well and septic here for the Westcliffe house. Things are moving along slowly but surely. Craigslist and people I have met have been very helpful sourcing casement windows for the project. The windows I have are very well made – they came out of a local bank building that was remodeled. Now I think I will reconsider just how I will mount them in the wall. 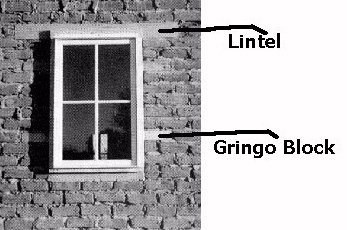 I had not heard of gringo block’s before, I will probably start seeing them everywhere now. Thanks Owen.